Ruins of an Arabic village, which was built over the earlier city of Biblical Nahalal and Roman Mahalul. 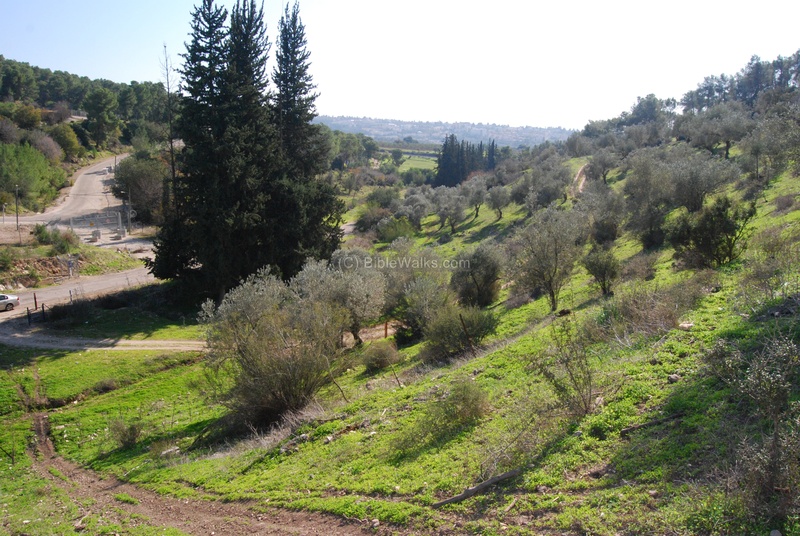 In modern times the Biblical name was given to Moshav Nahalal, which was built nearby. Judges 1: 30: "Neither did Zebulun drive out the inhabitants of Kitron, nor the inhabitants of Nahalol; but the Canaanites dwelt among them, and became tributaries". Nahalal is a famous agriculture settlement, the home place of late General Moshe Dayan. The name is based a nearby Biblical city - Nahalal - which was one of the cities of the tribe of Zebulun. 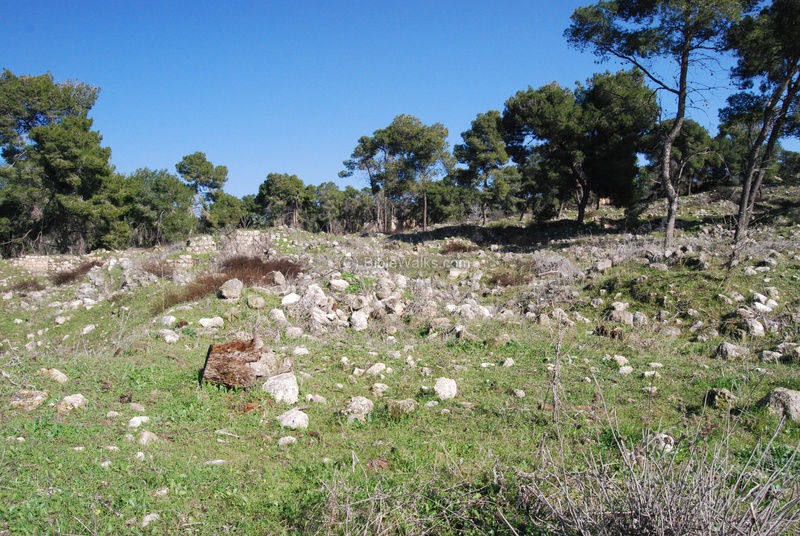 The ancient site is identified at Ma'Alul - the ruins of a large Arabic village, located on a steep hill 3KM west of Tell Shimron. Ma'Alul itself was built over the ruins of the earlier periods. The site's height is 275M above sea level, about 100M above the valley below. This steep climb made the location a perfect choice for the ancient city. 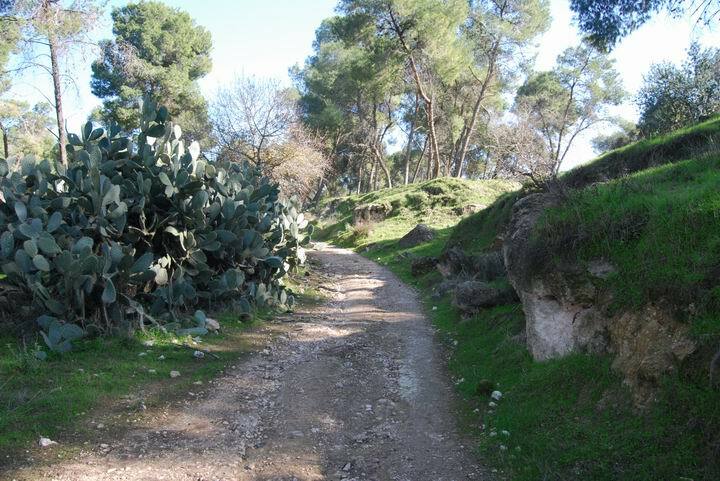 The city was close to strategic roads: An ancient road passed in the valley west and north of the city, going north-east towards Sepphoris. Another road passed south of the city, through Migdal Haemek, to Yafia (Jaffa). The city was also close to the large Biblical city - Tell Shimron - located at more ancient crossroads. This location gave this site its importance at the biblical periods and at later periods. The ruins of the city can be reached from a small road that turns north 200M north of the entrance to Migdal Haemek. The north and western parts of the site are located inside a secured military camp, and therefore it can be reached only from the hillsides on the south-east side. You can park the car near the modern Mekorot wells, and walk up the steep hillside. You can also drive up the dirt road that starts east of the wells, but you need to open and close the cattle fence gates along the road. According to the archaeological survey, Nahalal was inhabited in the Early Bronze period (3150-2200 BC) and in the middle Bronze (Caananite) period (2200-1550BC). Nahalal was one of Zebulon tribe cities (Joshua 19: 15) and also a Levite city (Joshua 21: 35). The Bible (Judges 1:30) also tells us that initially the city did not yield to the conquering Israelites, due to its strong fortifications, but paid taxes. An archaeological survey identified remains from the Israelite (Iron) period. The Assyrians captured the Galilee (732 BC), and destroyed the city. As per the Bible (2 Kings 15:29):" In the days of Pekah king of Israel came Tiglathpileser king of Assyria, and took ... Galilee... and carried them captive to Assyria". The site was re-populated later, in the Persian and Hellenistic periods. During the Roman period the Jewish Roman town was called "Mahalul". The town flourished from the commercially strategic location during the Roman/Byzantine times (Mishna and Talmud). It is mentioned in the Jerusalem Talmud (Megila page 2 , 2 1:1, Hebrew): "Nahalal is Mahalul", and listed among the walled cities from the period of Joshua. The village contained a magnificent Roman mausoleum. 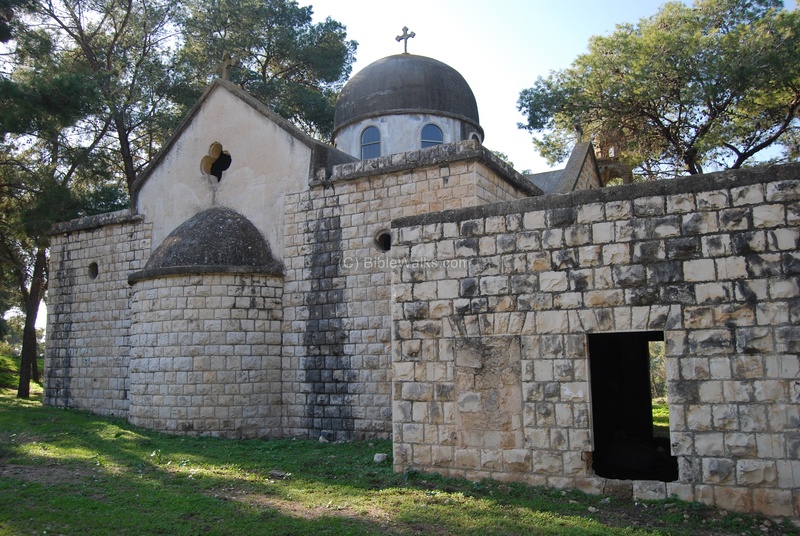 The Roman village may have been one of the Galilee towns that were visited by Jesus, whose home town of Nazareth is located only 6 KM east to the village. The town was probably destroyed in the Arabic period (8th C), and the site was in ruins for many centuries. A large Arabic town, Ma'alul was established in the Ottoman periods, and preserved the ancient name (Mahalul/Nahalal). 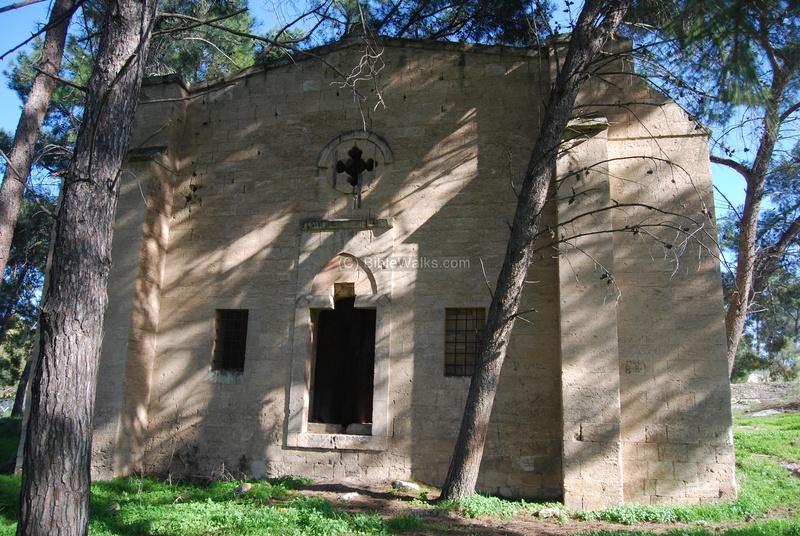 Before its destruction in 1948 the town had about 200 houses and 800 residents, a mix of Christians and Muslims. 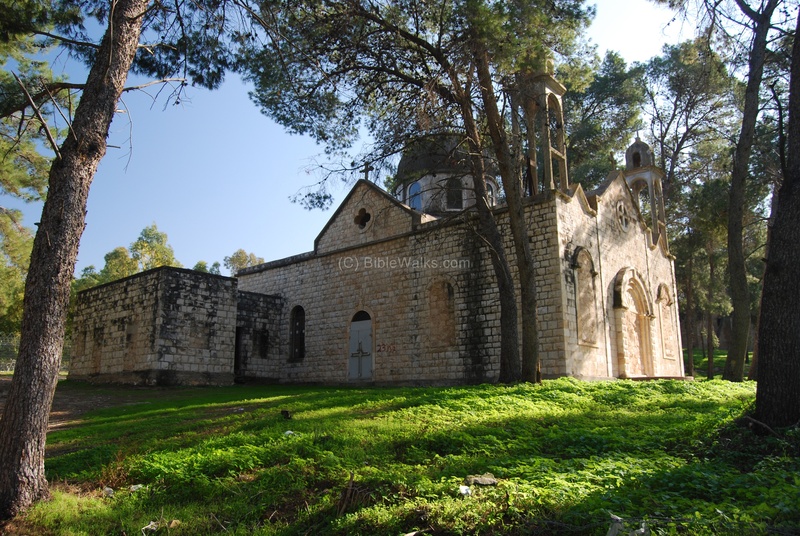 The town is in ruins today, and only the 2 churches and the mosque are left from the village of Ma'alul. The area of was examined in the Palestine Exploration Foundation (PEF) survey (1866-1877) by Wilson, Conder and Kitchener. The map below on the right is a section of their survey results. 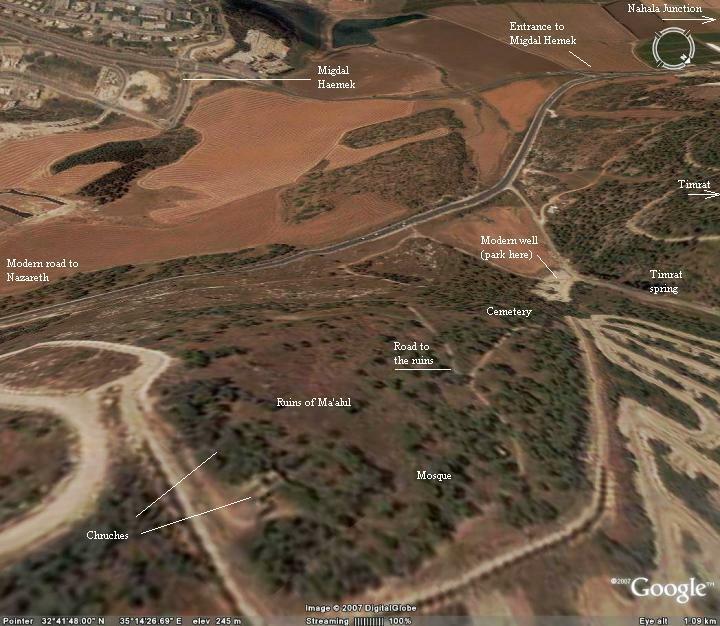 Notice the double-dashed line that passes near the village of Malul, which was one of the main roads to Nazareth.
" Malul - A mud village on a hill, with open ground on the west, where stands the prominent ruin Kusr ez Zir. The place is said to have had a population of 280 souls, and a tillage of forty-two feddans, in 1859 (Rogers). The water supply is from a well in the valley on the north". "Kusr ez Zir - This curious monument stands outside Malul, on the hill, with flat ground to the east and a steep slope to the west. It is surrounded with cactus hedges. A plan of it was first made by Colonel Wilson, The place appears to have been a tomb chamber, 21 1/4 feet east and west by 14 north and south inside. The bearing 102° Magnetic. The east wall now is 5 1/2 feet thick, but broken away ; the east and west walls were originally 6 feet 3 thick ; the north and south walls are 10 feet thick. The building stood on a podium, surrounded with columns, whose bases are on a stylobate projecting from the podium ; the pillars are 2 1/4 feet diameter. Thus the total exterior measure alony the podium is 36 feet north and south, and the same east and west. The building was originally in two storeys, the lower of which remains almost intact, with the roof still on. The proper door, 5 feet broad, was on the east, in the middle of the wall, with a descent of two steps. In the north wall are two kokim, 8 feet long, 3 feet 3 inches broad, raised above the floor 2 1/2 feet, and 3 1/2 feet high. 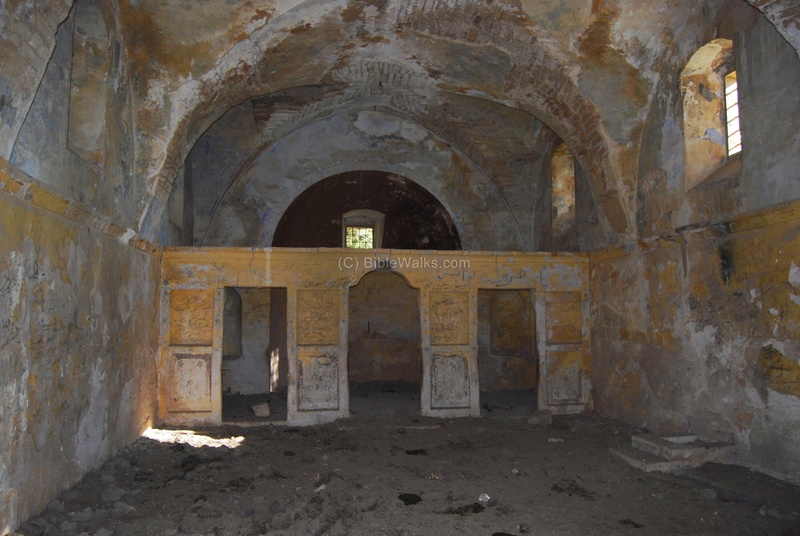 A similar pair of kokim existed on the south, but the western has had its end broken out to make a door, now in use. The interior of the chamber is about 15 feet high, roofed with a semi-circular barrel vault. It has ten courses of masonry - five large, five small ; the crown is 7 feet above the haunches. The walls are of fine ashlar ; the average length of the stones 3 1/2 feet, breadth 16 inches, and 2 feet 2 inches height of the course. The material is a moderately hard limestone, found in a quarry near. The mortar is hard and black, mixed with ashes and charcoal ; but the exterior joints are set in hard white mortar. In the core of the wall, small pieces of black basalt are packed in the joints, which are 3 inches broad in these cases. The vertical joints are carefully broken, and the stones are built in a sort of irregular bond in the thickness of the wall. The masonry is pick-dressed in horizontal lines on the interior, and in some places hammer-dressed on the exterior ; but the stones are much weathered. On the west wall there are recesses cut in the stones to hold small votive lamps inside the chamber. The floor of the upper storey is paved with flags 12 to 16 inches square. The eastern door has the sill made of block of basalt. No rubble is used in any part of the building. There are two small holes in the barrel vault of the lower storey. The entrance on the east has a semicircular arch, with six voussoirs each side of a central keystone. Between the kokim on the north and south walls, inside, about six feet from the ground, there are two brackets of stone. The upper story is indicated by the corner pilaster on the north-west, which stands up some ten feet or more above the top of the vault. The lower parts of the pillars, five in number, are still visible all along the north side. The corner pillar on the north-east has been destroyed. One pillar exists on the east wall, one on the west. Thus it is evident that originally the monument had six pillars on each side, the corner pillars being only quarter circles in plan, built into a square projecting pilaster. The capitals have disappeared, but in the interior of the building is an Ionic capital, with a shaft having twenty-two flutings. The bases and the stylobate have very simple mouldings. It is now used as a Greek church, being adorned with small pictures on wood inside. The south-west koka forms the door. "This place was visited by Guerin in 1854 and again in 1875. He reports that during that period the destruction of the monument has been very rapid. At his second visit, three years after Lieutenant Conder's examination of the place, he found the inhabitants tearing down the stones with pickaxes in order to sell them at Nazareth. Possibly by this time the whole of the monument has been destroyed". In 1921 the Jewish settlers came to the hill nearby. After then they relocated to the valley, a site 2Km south-west, where the modern Moshav of Nahalal is located today. Nearby, 1KM west to the ancient city, a new community settlement of Timrat has been established in the 1981. In 2011 BibleWalks discovered a Roman period marking in Hebrew, with the letters "Sha-ba-t". It is located nearby in Timrat, within the range permitted for walking on a Sabbath. This was the first ancient Sabbath marking found in Hebrew (see story in our blog). An aerial photo of ancient Nahalal/Ma'alul is shown below, with a view towards south. It indicates the major points of interest and the roads around it. 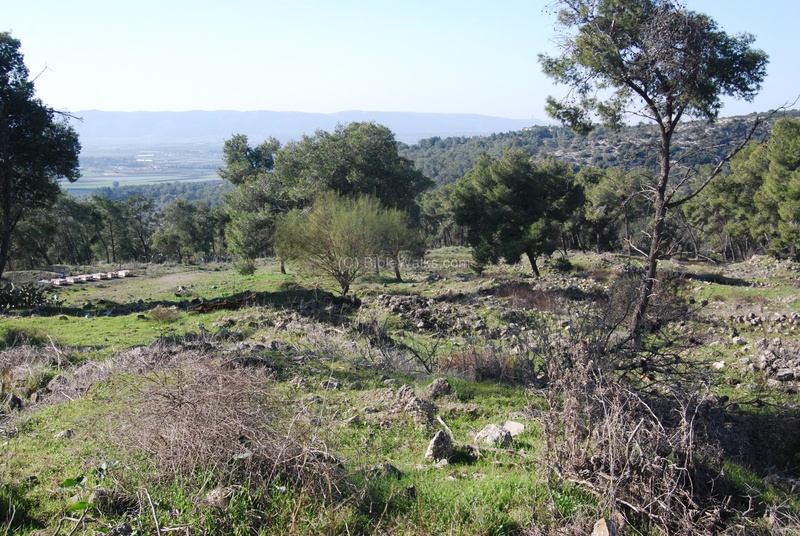 The ruins of Ma'alul and ancient Nahalal are located on a steep hill above the road to Nazareth. The photo below shows the view from the south side. The pine tree forest covers most of the ruins. This is a view from the hillside, just below the ruins of the village, towards the south. The valley of Yizreel (Jezreel) is seen in the background. Mount Carmel is seen in the far background. A valley is located west to the site. This valley used to be, during the Ottoman period, the path of the main road that led from Yizreel valley up to Nazareth. At the entrance to the valley is an ancient spring called "Timrat" spring, which collected its water into a reservoir. 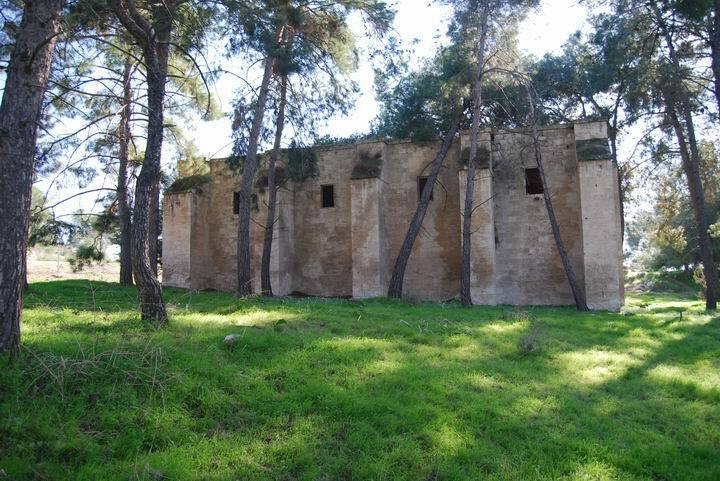 The structure is from the Ottoman period and was used by the village and the travelers that passed through the road. View of the south-west entrance to the village is seen in the photo below. This is the view of the road that passes through the village. The cactus bush on the side of the road was a typical fence used in ancient villages. Another entrance is located on the south-eastern side of the village. The city in the background is Migdal Haemek. On the west side of the south-western entrance road is an Arab cemetery, and one of the grand tombs is seen below. Some ancient trees grow around the tombs. 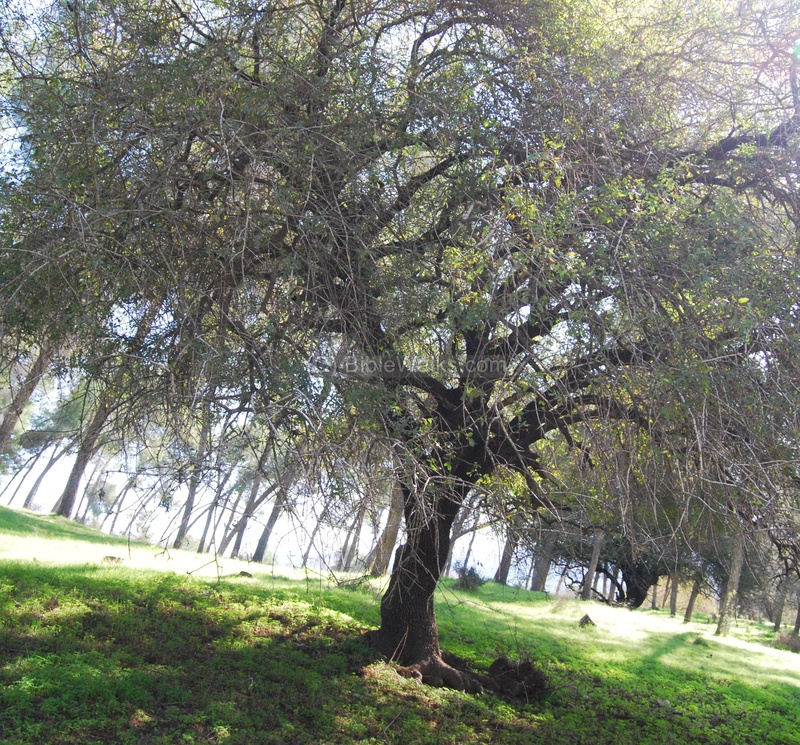 For example, this Anacardiaceous-Pistaci ("Ella-Atlantit" in Hebrew), a tree that grows in ancient cemeteries. Since it is sacred - it spared the fate of other trees that were cut down in the Ottoman period for fuel, coal and wood for the train that passed through the Yizreel valley. The top of the hill is covered with ruins of the 200 buildings that were part of the Arabic town of Ma'Alul. Some of these ruins are located on top of earlier periods and reused their stones. A view towards the south-west, with more of the ruins covering the entire landscape. 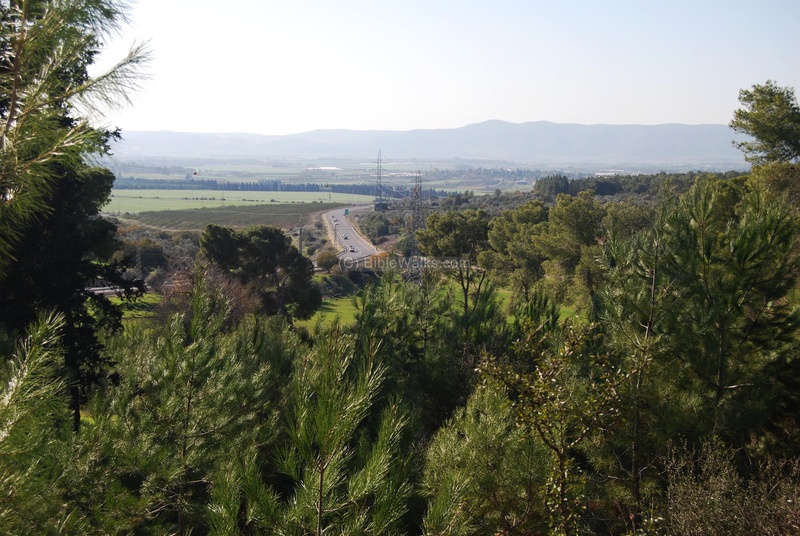 The valley of Yizreel (Jezreel) is seen in the background (the green fields seen behind the trees). Mount Carmel, located 15KM away, is seen in the far background. 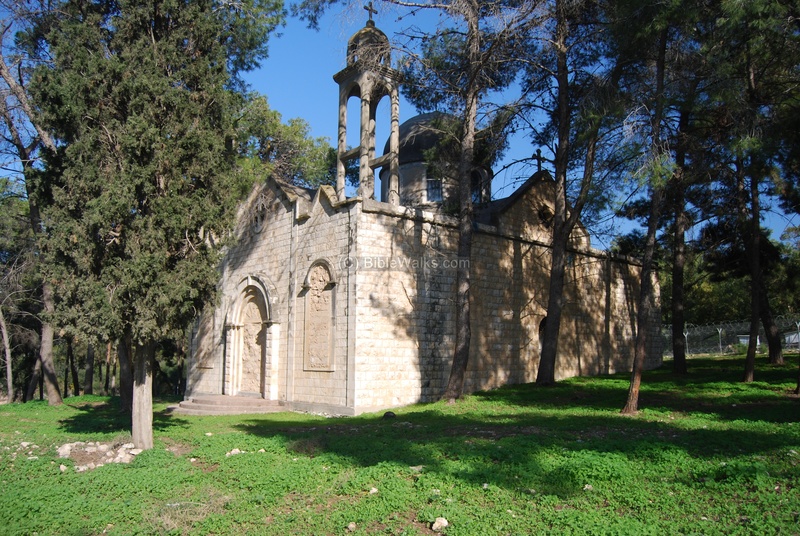 The two churches of Ma'Alul, Greek Orthodox and Catholic, were the only of the three remaining structures. They are located on the east side of the village. The photo below shows the west side of the southern Church. The floor of this church is completely gone and its interior is in a bad shape. A north view of this church. North to the first church is the second church, a larger structure and in a better condition. The entrance is located on the west side, and is sealed. A view of the east side of the church. The interior of this church is in a better shape. Another view of the church - from the north side, where the current entrance is locked to protect it from looting. Another building that remained on the north side of the village is the mosque. A detail of the window on the north side. and Kattath, and Nahalal, and Shimron, and Idalah, and Beth-lehem; twelve cities with their villages. This is the inheritance of the children of Zebulun according to their families, these cities with their villages". "Dimnah with the open land about it, Nahalal with the open land about it; four cities". Nahalal - the source of the Biblical name is not clear, but may have based on the Canaanite name of the city that preceded the Israelites - maybe "Nahal". In Hebrew "Nahal" may mean "managed" or "guided by" or "lkead by". Thus the name may be interpreted as "guided by God". In Psalms 23: 2 ("He maketh me to lie down in green pastures: he leadeth me beside the still waters.") the Hebrew word "Yenahaleni" is associated with herds and water, so the name may mean "led to the water". The area is indeed rich in springs and may have been the source of the name. Mahalul - the name of the Talmud/Mishna period Jewish town, preserved the Biblical name. Ma'alul - the Arabic town, preserved the Jewish name. Timrat - A new settlement west of Ma'Alul; named after the tree Tamar (Hebrew: palm tree). Initially it was a Kibbutz (est. 1947) called "Timorim", which relocated to the south in 1954. In 1981 the site was re-established as a community settlement. 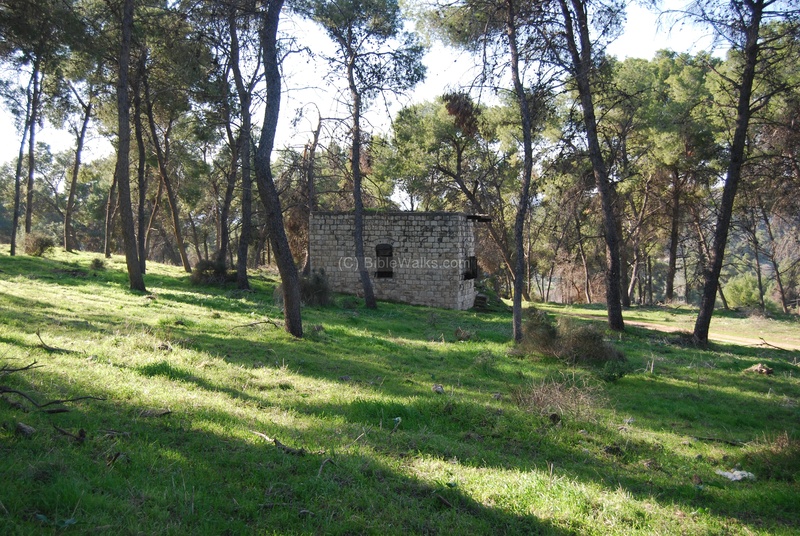 Tel Shimron - the Biblical site 3KM west, close to the modern "Nahalal" junction. 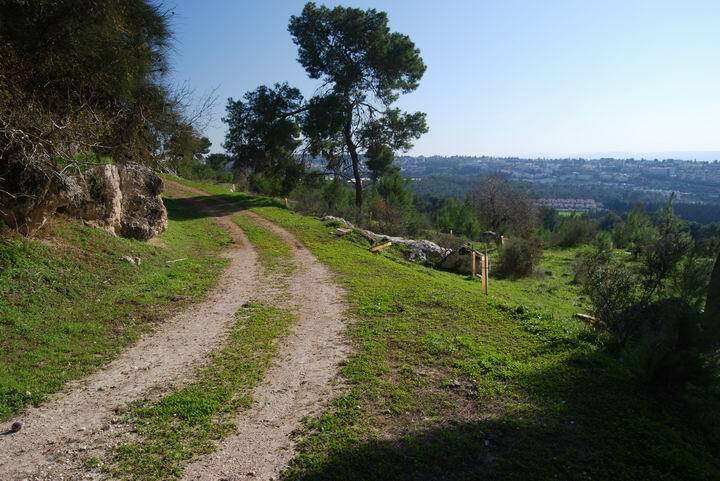 Migdal Haemek - the city is located 3 KM SE. There are here a few remains from the Roman and Arabic village, but the old Churches stayed intact and can be visited.